Here I mean to reflect on experiences I have had assembling and updating what is intended to be a relatively affordable home-theater system. My working premise is that DVD-Video can provide much better video and sound than other affordable TV delivery systems and much more content at a much lower equipment cost than HDTV. I think most consumers have yet to discover this, or else they think it is hype, even though many already own their first DVD player. The photograph below shows my system as it exists today. The photo is dominated by a 32-inch Princeton Graphics AR3.2T monitor, which I purchased about 2 years ago.This monitor accepts cable and S-Video TV inputs and personal-computer video signals up to XGA resolution. 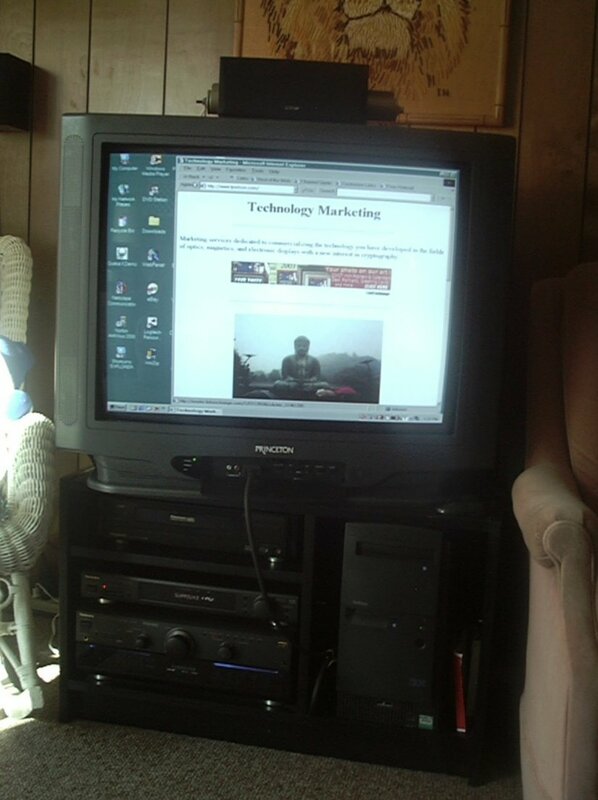 It does not have component inputs, but I use the computer input for progressive-scan DVD playback. You may be able to see the video cable com ing up to the front panel (VGA-2) input from an IBM Netvista A40 micro-tower. I purchased this computer on e-Bay about one year ago. It came with a 4X AGP NVidea graphics card with 32 Mbytes of ram. The video signal from this card is overlayed with DVD-Video by a Hollywood Plus DVD/MPEG-2 playback card from Sigma Designs. The computer came with only a CD-ROM drive, so I added an aftermarket DVD-ROM drive. It is white but doesn't show because it is insalled in a drive bay behind a door covering the upper front of the computer. The DVD/MPEG-2 playback card also delivers the digital sound signal through an spdf ouput to a TECHNICS SH-AC500D Dolby AC3 SoundProcessor (decoder), which in turn is connected to a Technics SA-AX6 Receiver. I needed the decoder when I installed the computer instead of replacing my first DVD player, which had stopped working. The rest of the sound system had been in place for a couple of years before that. The receiver drives a passive Technics SB-500 subwoofer and a Take5 home-theater set from Energy Loudspeakers. The Take5 system was highly rated and the small size of these speakers made wall mounting the left, right and surround speakers easy. You can see the center speaker on top of the monitor and the left speaker on the wall behind. I chose Technics components for the rest of the audio system because I was eligible for a Panasonic employee discount at the time. I don't claim to be an expert on audio quality, but the system sounds very good to me, and it's amazing how much sound can come out of those little speakers. The current configuration works well most of the time, but I have had to overcome a few problems and mistakes. The biggest problem was to find a video configuration that realizes the high image quality that is possible in DVD playback. I had another 32-inch set w ith 480p capability and built-in scan doubler for about a year before getting this one. Displaying the sharpness test pattern provided on the Video Essentials disc (from my original DVD player, which didn't haveprogressive scan)showed annoying vestigal lines, probably caused by ringing in the video amplifier. I was amused when a service technician tuned in a weak channel and convinced himself that he could see changes in the sharpness by looking at the video noise. It turned out that the sharpness control on that set didn't work at all. My current set doesn't even have a sharpness control. It also displays a poor sharpness test pattern through the S-Video input, as shown in the picture above on the left. (It is a close up of a small pair of lines at right angles at the center of the test pattern.) However, the result using the VGA input, in the picture on the right below, is much cleaner. Actually, the horizontal black bar looks relatively clean in both cases because it is determined by the vertical position of the electon beam. But the problem with vertical lines as displayed with the S-Video input is not subtle at all. The black line is surrounded by spurious white lines that are evidently caused by errors in the video amplifier in the "vision box" tacked on the back of the set. There even seem to be second-order spurious black lines outside the white ones. The lesson I think I learned from all this is that one should not assume that the bandwidth of a consumer-electronic video system will or can be adjusted properly. However, a system designed for personal-computer use has to work well in this respect because text would look terrible otherwise. Our home theater is the family room in a 1960 vintage split-level house, so most of the installation problems were caused by lack of space and the need for everything to be black. The paneling happened to have black vertical grooves, so I didn't bother running the wires to the front left and right speakers behind the wall. Instead, I just ran black electrical wire in front of the grooves. I liked the idea of hiding those wires in plain sight. The surround speakers are mounted near the ceiling, but running the wires over the ceiling stumped me for a while. Then I had the idea of pushing a leader through with my metal measuring tape, which resists buckling to some extent. It wasn't easy, but it finally worked. Later, my son told me that this is a standard technique and there are special "fish tapes" sold for the purpose. The most natural place for the system is against a short section of wall separating the family room from the basement. We already had two chairs flanking the old tv there, leaving a trapezoidal foot print for the system. It is wide enough for a 32-inch set, but not much wider at the front, so I needed a stand of about the same width. I ended up cutting about 5 inches off the right side of an Ikea tv stand to make it fit. The maximum vertical space available is very close to 15 inches high, which made finding a suitable omputer more difficult because most tower computers were taller than this a year ago. (It would also have been hard to fit a desktop case in the wider section because that space was already occupied.) Fortunately, the IBM microtower is available in black and just fits (with a little push). Currently we have separate remote controls for the TV, VCR, and AV receiver plus one more for the Hollywood Plus card. The AV receiver can switch some of the video signals, but I found it more natural to connect all the video sources directly to the TV and use its remote to select video.. The audio is still switched at the AV receiver, so selecting a source basically takes two steps. Besides those two, when we are watching a DVD movie, I use my Logitech cordless keyboard and mouse to get DVD playback started, and then pick up a Hollywood Plus remote to navigate DVD menus. Operating the system from all these controls or front-panel inputs is a little inconvenient for me and a major hassle for family members, so I will probably try to integrate all the basic functions into a universal remote control sometime. The cordless keyboard and mouse work ok from a coffee table about 4 to 5 feet from the system, but not so reliably from the couch behind the table. I may be able to find a better place for the sensors that the remotes talk to with more experimentation. I also have a Logitch cordless joystick that operates at 2.4 GHz and has more range and works well from the couch. I downloaded the demo version of NASCAR 2002 to get the full effect of the system for gaming. I thought the effect was better than arcade quality with the big clear picture and loud stereo sound combined with the comfort of the couch, but of course further improvements are still possible. In particular, hardware and software are available that use all 6 speakers to create an even more intense 3D experience. Joe Kane, Video Essentials, see http://www.videoessentials.com for latest information.